Canon Pixma MP190 is an all-in-one photo printer aimed for home and small office setups that automatically detects the type of document that implies whether it is a photo, a text document or even a page from a notebook and then processes the image with optimal settings. This mediocre sized printer has dimensions of 17.7(W) x 13.9(D) x 6.7(H) inches and weighs approx. 5.8 kgs. The printer has a printing speed of 4.1 ppm in coloured printing and 5.5 ppm in monochrome printing with a maximum optical resolution of 600 x 600 dpi in monochrome printing and 4800 x 1200 dpi coloured printing. The picture quality is commendable along with the colour sharpness provided by Canon Pixma MP190 Ink Cartridge which makes the printer well suited for amateur photographers. Canon Pixma MP190 lacks PictBridge technology, unlike its other Pixma models. Also, the lack of memory card reader is a setback for the printer. The printer allows connection through a USB port. The printer has an attractive and small built which makes it commutable. This model of Canon has smooth and noiseless printing, the print starts at one click without delay. The LCD helps easy user and printer interaction. 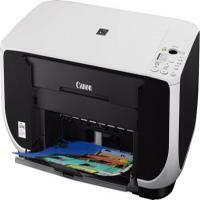 Canon Pixma MP190 is an all rounder printer which is suitable for Amateur photographers, home and small office setups. The printer lacking PictBridge technology, WiFi, Bluetooth and memory card reader, it only allows USB connection. The colour quality and brightness of Canon Pixma MP190 ink cartridges enhance the printing quality. Overall it's a value for money deal for daily use printing not requiring networking. Q. How many pages can I possibly print with a Canon Pixma MP190 printer in a single print job? A. Canon Pixma MP190 printers have an automatic sheet feeder that can handle up to 100 pages. Therefore, it is possible to print up to 100 pages in one print job. Q. My Canon Pixma MP190 printer recently stopped working, but I still have spare ink cartridges for the same. Are there any other printers that use the same ink cartridges as the MP190 printer? A. Yes, Canon Pixma MP190 ink cartridges are compatible with various other printers such as the Canon Pixma iP1700, iP460, MP160, MP210 etc. You will find a list of printers compatible with the ink cartridges here. Q. Where can Canon Pixma MP190 printers ideally be used? A. Canon Pixma MP190 printers are quite compact and lightweight. They produce good quality outputs which makes them suitable for houses and small offices. MP190 printers are also capable of producing high quality pictures with sharp and vivid colours making them suitable for ameteur photographers as well. Q. Should I be worried about any damage caused to my printer while using compatible Canon Pixma MP190 ink cartridges? A. Absolutely not! All our compatible ink cartridges are of high quality that have been FSC tested and certified. They will work perfectly fine with your printer and you do not have to worry about any damage caused to your printer. Q. What are the various file formats I can choose when saving scanned images with this printer? A. Canon Pixma MP190 printers are capable of saving the scanned images in BMP, JPEG, Exif, TIFF and PDF file formats. Q. I have placed an order for Canon Pixma MP190 ink cartridges from your website. Is there any way I can receive the ink cartridges by tomorrow? A. Please contact us on 048 308332211 regarding this query. We will check stock and try our best to deliver the product to you faster than the standard delivery time. Q. I got incorrect and poor-quality prints while printing through Canon Pixma MP190. What should I do now? A. When printing becomes faint or colours are incorrect, the print head nozzles on Canon Pixma MP190 Ink Cartridges are probably clogged. Print the nozzle check pattern to confirm the condition of the nozzles and then perform printhead cleaning. If print results are not satisfactory, aligning the printheads might improve the print quality. Q. How many pages will my compatible Canon Pixma MP190 Ink Cartridge can print? A. It really depends on what you are printing. Printing a text document doesn’t make use of much ink as when you print a photo. One can print approximately around 490 pages in black and 312 pages in tricolour using the compatible cartridges. Customers tell us that our cartridges produce at least as many pages as those they get using the original brands. Q. How can I connect this printer to the wifi router? A. Hi, the Canon Pixma MP190 allows USB connection only to the printer. This means it can only be connected to your computer via a USB cable. It does not support wifi. Q. I am placing the order first time for the Canon Pixma MP190 ink cartridges. Where can I find the serial number of my Canon Pixma printer? A. The location of the serial number may vary between different Canon products. The serial number for your PIXMA printer will be the combination of letters and numbers. The number will be printed on a sticker and can be found either on the back or inside of your machine. Confirm that the Power lamp is lit green. If the lamp is off, turn the machine on. If the Power lamp is flashing green, this means that the machine is initializing. You must wait until the Power lamp stops flashing and remains lit green. If the Alarm lamp is lit orange, an error may have occurred on the machine. For details on how to resolve the error, refer the online user manual.